Retief Goosen of South Africa carded a one-under-par 70 to lead by a single stroke after 36 holes of the Northern Trust Open at Riviera Country Club in California. Goosen played steadily in tough conditions at Riviera and birdied his closing hole to end the day one ahead of Americans Ryan Moore and Justin Thomas and Graham DeLaet of Canada. It’s four years since the last time the 46-year-old South African has led at the halfway stage on the PGA Tour. The players have compared conditions at Riviera to those they’d face at a U.S. Open. The greens are so firm it’s difficult to get grip even with a full shot. “I hit a handful of what I would say are as good of shots as I could possibly hit the last couple days and ended up with 45-footers,” said Ryan Moore who posted a 68 to go into the weekend in a tie for second place with Justin Thomas and Graham DeLaet. The Canadian scored an excellent second round 67. Angel Cabrera made two bogeys in his last three holes but still shot a 68 to reach four-under-par – two behind Goosen. 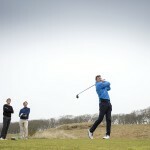 England’s Paul Casey continued his steady progress with a fine round of 69. He’s now tied for sixth place with Bubba Watson, Jordan Spieth, Derek Fathauer and J.B. Holmes. Nick Watney briefly reached seven-under-par on his front nine. But he struggled on the run for home and eventually posted a 74. He’s now at two-under-par in a tie for 11th place.